Every time I go grocery shopping, I wander up and down the aisles and am inevitably drawn to the colorful nail polish racks. Whenever I go to Sephora, I practically beeline it towards the little bottles and start "testing" away (aka giving myself an in-store manicure). I totally got over that awkward "Can I help you?" moment a while ago...."Nope, just giving myself a free manicure!!! Thanks though!!" 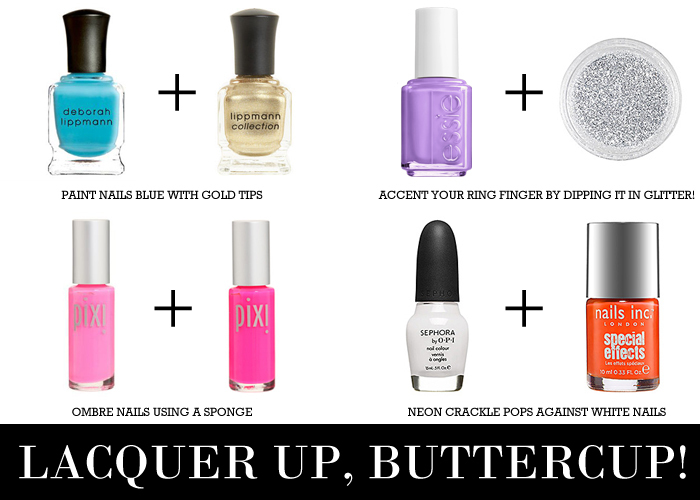 Nail polish is such a fun way to play with color, and are also relatively cheap to change up if you go the DIY route. I've been sporting accent nails in pastel hues, neon brights, bright blues with silver tips...you name it, I'll lacquer and layer it on! Above are some nail art trends I am loving for summer! Any hues/trends you are loving in partic? There should by a Nail Polish Anonymous. I'm a total addict too. Haha, yes, I'm totally the same way at Sephora! (Don't mind me, just doing a little nail-painting here in the corner! ;) I'm loving really bright hues this summer! obsessed with essie right now! and with the ring finger glitter, oh girl just LOVE! haha! I do my nails what feels like daily! I need a little glitter in my life! Love all these ideas. I love the Pixi polishes! !